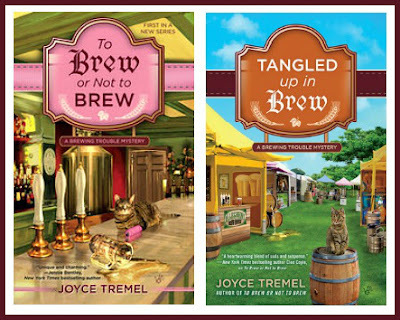 Mystery Lovers' Kitchen: Welcome Joyce Tremel with Tangled Up in Brew #BookGiveaway! Welcome Joyce Tremel with Tangled Up in Brew #BookGiveaway! Thanks so much for having me back, MLKers. 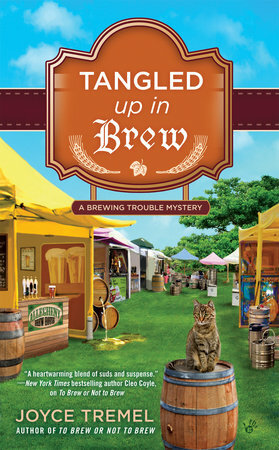 I can’t believe I actually have another book coming out—TANGLED UP IN BREW releases on October 4th! It honestly seems like yesterday that TO BREW OR NOT TO BREW was released. TANGLED UP IN BREW has four recipes, one of which is the burger that chef Jake Lambert prepares for the competition at the Three Rivers Brews and Burgers Festival. While the burger is certainly tasty, I decided another recipe would do more in the way of tempting yinz guys to go off any diets you may be on. So I present you with the owner of Cupcakes N’at, Candy Sczypinski’s recipe for Caramel Pecan Brownies. Directions: Preheat oven to 350 degrees. Line a cookie sheet or mini-muffin pan with approximately 48 foil cups (2 inch size). Melt butter in large saucepan. Add chocolate chips and stir until melted. Add sugar and vanilla and mix thoroughly. Remove from heat and add eggs one at a time, stirring thoroughly after each one. Stir in flour gradually until mixed well. Fill cups to approximately ¾ full. Bake for 25 minutes. Do not overbake. Directions: Melt caramels and water in saucepan over low heat, stirring occasionally. Remove from heat and stir in vanilla. 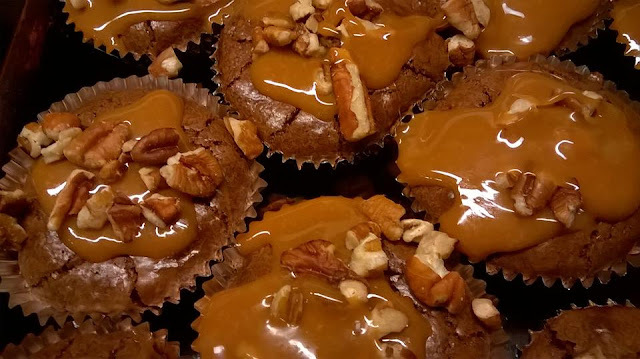 Drizzle caramel over cooled brownies and sprinkle with chopped pecans. Thanks again for letting me share my recipe! Joyce Tremel was a police secretary for ten years and more than once envisioned the demise of certain co-workers, but settled on writing as a way to keep herself out of jail. 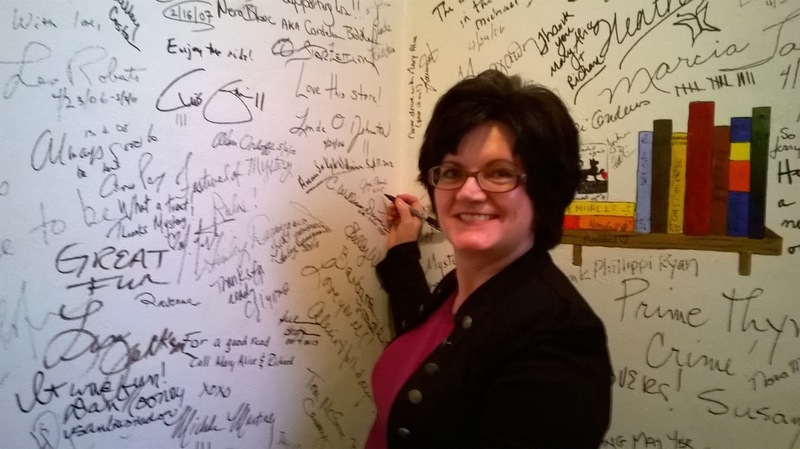 Her flash fiction has appeared in Mysterical-e, and her non-fiction has been published in the Pittsburgh Post-Gazette and the Pennsylvania Chiefs of Police magazine. Her debut novel, TO BREW OR NOT TO BREW was nominated for a 2015 Reviewers’ Choice Award for best amateur sleuth by Romantic Times. The second book in the series TANGLED UP IN BREW, will be released 10.4.2016, and the third book, A ROOM WITH A BREW, is tentatively scheduled for release in October 2017. Join Joyce on Facebook here. Follow Joyce on Twitter here. Brew pub owner Maxine “Max” O’Hara and her chef/boyfriend Jake Lambert are excited to be participating in the Three Rivers Brews and Burgers Festival. Max hopes to win the coveted Golden Stein for best craft beer—but even if she doesn’t, the festival will be great publicity for her Allegheny Brew House. Or will it? When notoriously nasty food and beverage critic Reginald Mobley is drafted as a last-minute replacement judge, Max dreads a punishing review. Her fears are confirmed when Mobley literally spits out her beer, but things get even worse when the cranky critic drops dead right after trying one of Jake’s burgers. Now an ambitious new police detective is determined to pin Mobley’s murder on Max and Jake, who must pore over the clues to protect their freedom and reputations—and to find the self-appointed judge, jury, and executioner. TANGLED UP IN BREW—your choice! The story sounds great, the cover is beautiful and the recipes look yummy. I would love the chance to read this book. Thanks for having the giveaway. I really loved the first book, and am greatly looking forward to the second one. Those brownies look amazing! I'm so excited for this book release! Thanks for the chance to win too! My husband would love these brownies and I would love to try To Brew Or Not To Brew. Thank you for the chance to win. Love the title and artwork on cover! The receipe looks mouthwatering, especially with caramels and chocolate. Can't wait to read your new book. Thank you for the opportunity to win such a great giveaway. Sounds like a great series. Look forward to reading this new series. Thanks for the kind comments, everyone! When I made these brownies when the kids were home for Christmas, all 48 of them disappeared in less than two days. I think I only got one! Which is just as well because they probably aren't good for the waistline. But they are delicious! This is a new to me series. I'd be delighted to win either of the books. The recipe sounds delicious. I'm eager to try it while visiting my daughter, son in law and new granddaughter. dbahn(at)iw(dot)net. I loved To Brew or Not to Brew, it got me excited to read mysteries again. Can't wait for Tangled Up in Brew! Loved the first book. Can't wait for book 2! I love a good brownie, but refer them without nuts so I'd make these without the pecans. Yum! I have this on hold at the library but would love to have my own copy. I haven't read this series yet. I'm always looking for new series. Thanks for the giveaway. How many pecans do you use? I didn't measure them. I just sprinkled until it looked right! I have a bad habit of not measuring things when I cook. Never ask me how I make my spaghetti sauce, lol. Sounds like another great entry to a fun series. And, yes, that recipe may just be the one that knocks me off my diet! Yum. Thanks for the giveaway. Hi! Thanks for sharing today! Brownies are a fave in my house and this version looks great, although I would leave out the nuts. I've been anxiously awaiting book 2! I own book 1 so I would choose Tangled up in Brew. I'm so happy to hear that book 3 is in the works. I hope this series has a long life! What a delicious post! Even though I am not a beer drinker I always love the character interaction and mystery in Joyce's books. The story sounds great as does the recipe. My son is a brewer. I would love to win a copy of Tangled Up in Brew.